The Medical Big Data Platform MediChain has set out to revamp the health care industry, in particular electronic health records (EHR) and electronic medical records (EMR) maintenance systems, and in the process liberate customers and foster cooperation between hospitals, patients, pharmaceutical companies, insurers and researchers. With its eyes set on such lofty goals, it should come as no surprise that MediChain is attracting the backing of prominent visionaries. The company has announced the appointment to its advisory board of serial entrepreneur Keith Teare, known for identifying and investing in innovative new companies. MediChain is tapping into demand from patients for a transparent market for electronic medical records and control over their personal information. The company is also attracting pharmaceutical companies and other players to the anonymized big data it will gather on its MediChain Platform. Coincidentally, early in his career Keith Teare focused on the benefits of shared data and networking. He has ever since identified ways to create and generate value from web-based products. As the founder and CEO of RealNames, he created a multilingual naming system based on natural key words. RealNames was included in the Microsoft browser in early 2000 and was at one stage valued at over $1.5 billion. 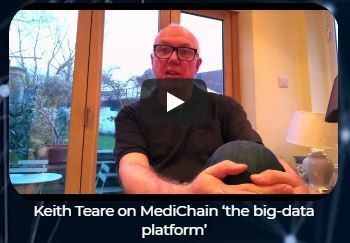 In addition to teaming up with Mike Arrington to co-found TechCrunch, an online publisher of news on the technology industry, and Edgeio, a distributor of classifieds and listings, Mr. Teare provided seed money and chaired NetNames, which founded major UK systems integrator Clerkswell, and co-founded CYBERIA, one of the world’s first Internet cafés. He also has significant experience on the market for mobile devices, working with the “search engine for apps” Quixey and business incubator Archimedes Labs. He is currently Executive Chairman of Accelerated Digital Ventures, which provides funding and expertise for UK technology startups.